I must candidly confess that when I was in seminary the 16th chapter of Paul's letter to the Romans didn't do much for me. It struck me as being boring nothing more than a long presentation of people's names, most of whom I could not pronounce; I usually skimmed over that part so I could get to what I considered to be the real Gospel. Over the years I have greatly changed my attitude about this particular chapter and I have discovered that there is much more to it than I had first imagined. For example, it is interesting to note that of the twenty-six people who Paul singles out for his personal greeting, six were women. Now that strikes me as being rather interesting, since Paul has frequently gotten a bum rap for being a male chauvinist. I think it also shows us the tremendous influence that women had in the early church. In the male oriented first century Palestine, it is telling that Paul could not describe the church without mentioning the significant role of women. Verse 13 of chapter 16 is particularly interesting and it is one that scholars have struggled with over the centuries. Paul writes: "Give my greetings to Rufus, chosen in the Lord, and his mother and mine." Now this statement could be taken two ways. It could mean that Paul had two distinct women in mind--the mother of Rufus and his own personal mother. Or, he could be saying: "I salute Rufus and his mother, who is like a mother to me." If that is what he meant, and most Biblical scholars agree that that is indeed what he meant, then it raises some interesting speculation. When and where did Paul meet Rufus' mother? Did she nurse him through some serious illness? Did she receive him into her home for an extended stay during his missionary journeys? How did this woman and Paul form such a close bond that he refers to her fondly as being like his mother? Mark tells us that Simon of Cyrene, the man who carried Jesus cross, had two sons: Alexander and Rufus. Was this the same Rufus to whom Paul was speaking? If that is true, his mother would be Simon of Syrene's wife. No one knows for sure who this remarkable woman was who served as a mother figure for the great Paul. 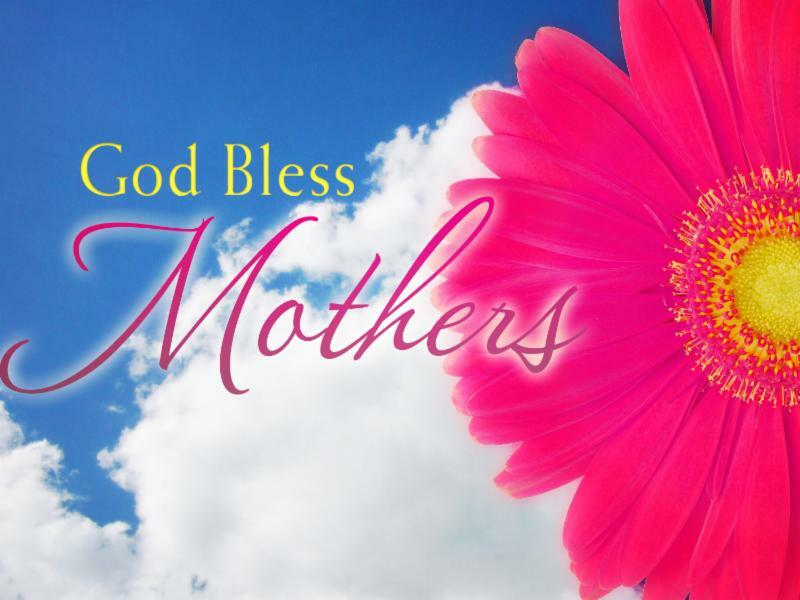 But it really makes no difference, because what he writes makes an excellent springboard for a Mother's Day sermon. Do you remember playing "Follow The Leader" when you were a kid? The "leader" called the shots. Whatever way the leader went, whatever the leader did, the "followers" were supposed to imitate. It was a fun game until some "leader" decided to do something, well . . . not smart. Jumping over a ditch was an adventure until someone didn't quite make it and tumbled down and got hurt. "Following the leader" goes bad when the leader goes bad, when the "leader" doesn't consider the welfare of the led. Sheep are great at playing "follow the leader." The "herd mentality" looms large in a sheep brain. If sheep are in a line and a stick is thrust in front of one animal, forcing it to jump over that barrier, all those following will jump over that stick - whether it is there or not. For sheep, seeing a member of their flock jump over "something" is enough to make the next animal jump up and over whatever that "something" is - whether it physically exists or not. Make one sheep jump and you can make a whole herd jump - regardless of whether there is actually anything to jump over. Growing up in Galilee Jesus knew sheep like a cowboy knows cattle. Jesus knew the instincts, the needs, the intuitions of the sheep that surrounded him in his homeland. Jesus used that everyday knowledge to reveal to the people he encountered the desires that he knew permeated and perforated their lives. Jesus always dealt with people on the basis of a one-on-one personal contact. But he also knew all about our communal needs - our desires to be connected in some way to a larger whole, to be connected to a community. Jesus knew we are needy lambs and yet also hopeful herds looking for a leader. What I want to deal with is leadership. People are saying in Boston, Mass, Palm Beach, Florida, and towns throughout our country that there must be something wrong with the church. Why has the religious leadership failed? Now let us travel 3000 miles to Israel. In towns very familiar to us because they are biblical towns there is a war going on in the streets. The two sides are deeply religious and yet they are at each other's throats. Even the children there are abused and used as human bombs. People are saying in Palestine, Jerusalem, Kabul, and in towns all over the east that something is wrong. Why has the religious leadership failed?